Today is the centennial of the sinking of the great ocean liner, the Titanic. There has been many interesting articles circulating around blogs, in the news, and on television to commemorate and remember this horrible accident. Today I’d like to share an interesting glimpse into the lives of one of the Titanic survivors and her baby, who she was pregnant with at the time of the sinking of the Titanic. John Jacob Astor was known to be the most wealthy passenger on the Titanic, and was bound for home from his honeymoon with his new (much younger) wife, Madeline. At the time of their marriage he was 47 and she was 18, and their marriage was quite a topic of gossip in their day. 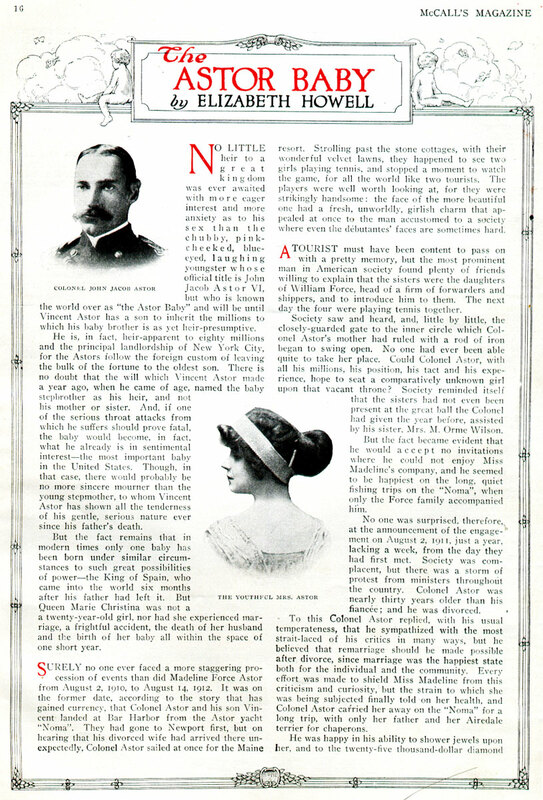 John Jacob Astor would not survive the sinking of the Titanic, but his wife did and did give birth to the child. 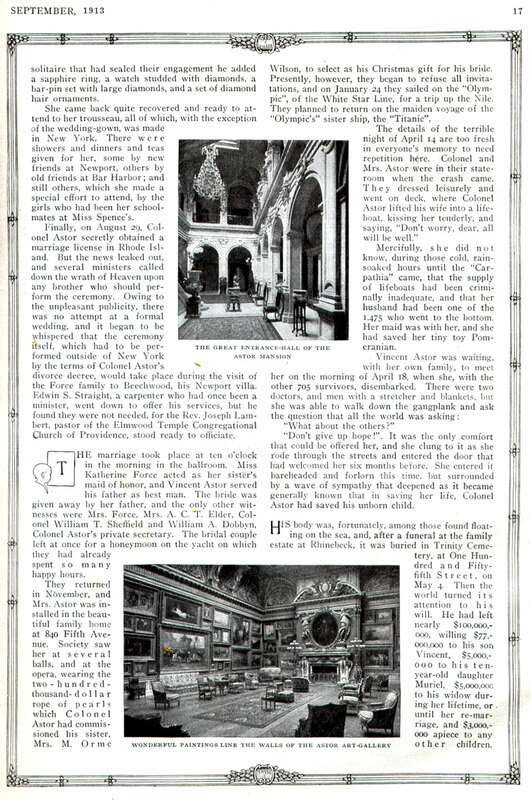 This article from McCall’s Magazine from 1913 takes a peek into Madeline and her baby’s lives. “The details of the terrible night of April 14 are too fresh in everyone’s memory to need repetition here. 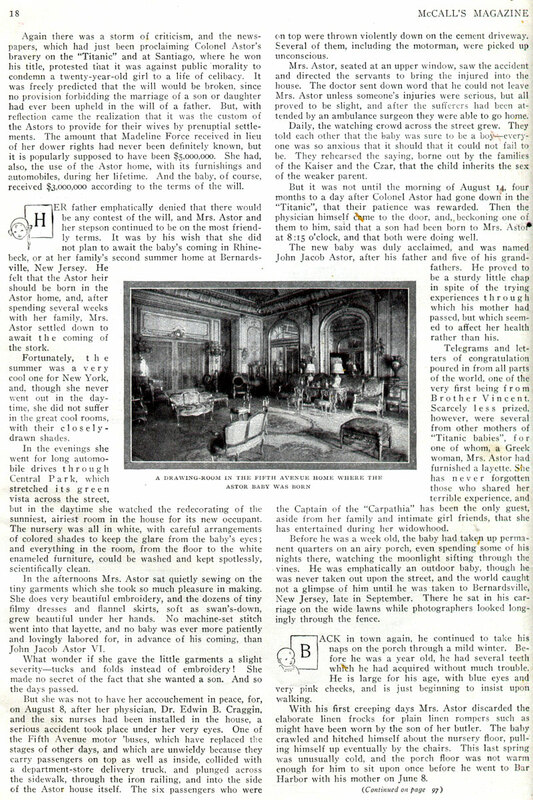 Colonel and Mrs. Astor were in their stateroom when the crash came. They dressed leisurely and went on deck, where Colonel Astor lifted his wife into a lifeboat, kissing her tenderly, and saying, “Don’t worry, dear, all will be well. I will let you read the rest of the article for yourself, as I think you will find it quite interesting to hear a little bit of what happened to these survivors. Click on any of the images for a larger version that you can read. Thank you so much for sharing this article! 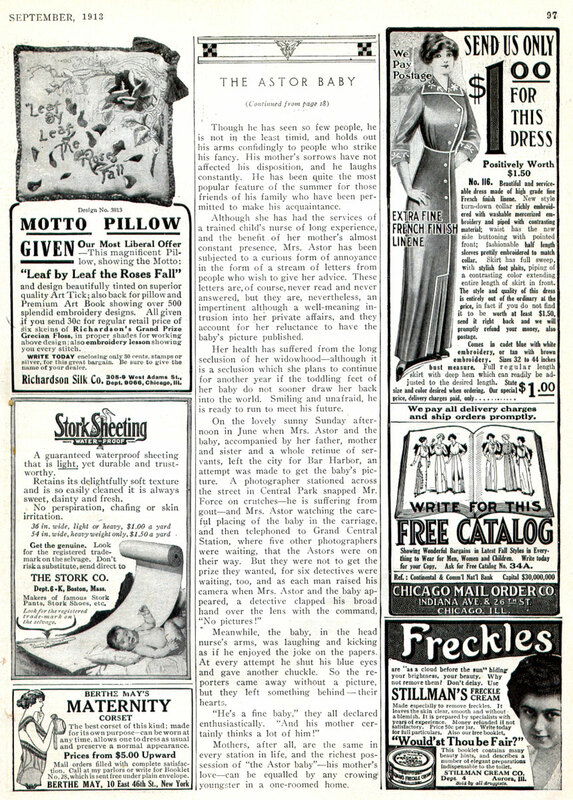 As a budding historian,it’s very fascinating to read it within the context of the magazine’s layout, including the ads alongside (especially the one labeled a, “maternity corset”). Many thanks! Thank you so much for posting the scans of this article! The story of the Astors has always been incredibly fascinating for me, starting with how they were portrayed in the film but more so with the research I did about them for a Titanic tea I planned. The desperation of the ship sinking was traumatic enough but adding on being 18 AND 5 months pregnant must have been such an ordeal. Thank you for posting this. The story of the Astors has long been a source of fascination for me, and even as a little girl I could not help but wonder how pregnant Madeline got on after the death of her husband that awful night. What a wonderful article! I also must note that I really like the little hand-drawn baby faces that start off each section of the article after that first page.